On December 19, 2014, the President signed into law the Achieving a Better Life Experience Act of 2014 (H.R. 647), commonly known as the ABLE Act. The Act now becomes Section 529A of the Internal Revenue Code and is modeled loosely on the Section 529 college savings programs already within the Code. According to the Act, its purpose is to “encourage and assist individuals and families in saving private funds for the purpose of supporting individuals with disabilities to maintain health, independence, and quality of life,” by providing “secure funding for disability-related expenses on behalf of designated beneficiaries with disabilities that will supplement, but not supplant, benefits,” provided by private insurance, Medicaid, Supplemental Security Insurance (SSI), the beneficiaries employment, and other sources. Who is eligible to have an ABLE Account? The beneficiary of an ABLE Account must be entitled to receive benefits from SSI or SSDI based on blindness or disability; the beneficiary must have been disabled prior to age 26 and meets the Social Security Income program’s standard for disability; and the individual will file a disability certification under rules the IRS will write. What is a disability-related expense? Any expense related to education; housing; transportation; employment training and support; assistive technology and personal support services; health, prevention, and wellness; financial management and administrative services; legal fees; expenses for oversight and monitoring; funeral and burial expenses; and any other expenses approved by the Secretary of the Treasury under the regulations. How does the money in the ABLE Account affect my eligibility for SSI and Medicaid? Amounts up to $100,000 in an ABLE Account will be disregarded in determining eligibility for SSI, except those distributions made for housing expenses. Amounts exceeding $100,000 in the Account will cause a suspension of SSI until those excess resources are spent. Medicaid eligibility is completely unaffected by the amount of funds in an ABLE Account. Who can establish and contribute to an ABLE Account? The beneficiary or any family member of the beneficiary can contribute to the Account; however the primary beneficiary has to be the owner of the ABLE Account. What is the tax treatment of the ABLE Account and distributions made from it? All amounts in an ABLE Account are exempt from taxation while remaining in the Account. Any distribution from the Account to a beneficiary for a qualified disability-related expense is also considered a tax-free distribution to the beneficiary. Upon the death of the beneficiary, all amounts remaining in the ABLE Account shall be distributed back to the State in an amount equal to the total medical assistance (Medicaid) paid for the beneficiary after the establishment of the Account. i.e. : The beneficiary establishes an ABLE Account in 2015, he begins receiving medical assistance in 2020, and he passes away in 2050. If there is $300,000 remaining in the Account in 2050 and the State provided $279,000 in medical assistance from 2020-2050, then the State takes $279,000 from the Account and the remaining $21,000 will be distributed to the beneficiary’s descendants. The ABLE Act is a big leap forward in legislation for disabled people, but there are many factors that go into planning for the future of a disabled loved one. It is important to understand how an ABLE Account works and then decide whether it may or may not be the right choice to include, based on the unique situation, in your disabled loved one’s plans for the future. Benjamin Franklin wrote that “There are only two certainties in life… death and taxes.” What Ben did not know then was that when you die in the United States today, you might still have to pay taxes in the form of either an Estate or Inheritance Tax. So maybe we should alter his quote a bit. 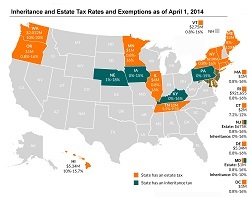 Here is a quick primer on Estate and Inheritance Taxes.